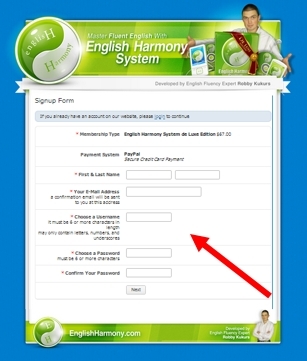 Here you can find answers to 99% of the most commonly asked questions about the English Harmony System de Luxe Edition. 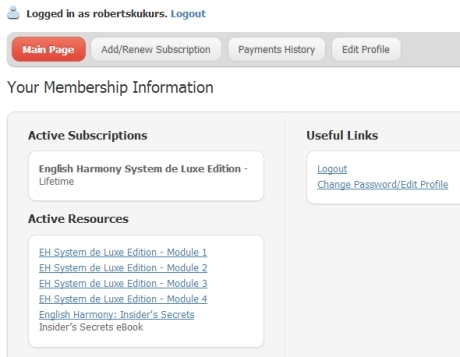 What exactly does the English Harmony System de Luxe Edition consist of? Are the lessons in the English Harmony System de Luxe Edition the same as your YouTube channel videos? What level of English is required to use the English Harmony System de Luxe Edition? Can even beginners with little English knowledge use it successfully? What’s the total amount of time that I have to spend on using the English Harmony System de Luxe Edition? Am I really going to achieve complete English fluency after a month? Is the English Harmony System de Luxe Edition downloadable? I’m interested in buying your fluency improving product, how can I do it? What is English Harmony all about? Is this a website for English learners? How can I improve my English? How can I speak like a native English speaker? Do you offer Skype lessons? I’d like to practice English with someone so could you help me out with this, Robby? Q: What exactly does the English Harmony System de Luxe Edition consist of? A: At the moment there are 90 speech exercising lessons included in the System (every lesson is around 10 minutes long). They’re video lessons where a digital character speaks with you and you have to repeat and memorize different English phrases, idiomatic expressions, and sentences; after that you have to use those phrases in a dialogue and it’s a great way to develop your spoken English! As far as I’m aware, EH System de Luxe Edition is the only software product focusing solely on getting you to speak the English language, and believe me – that’s exactly what you need after years spent studying English academically by writing and reading. All of those phrases, phrasal verbs, idioms and sentences included in the lessons have been purposefully selected by a native English speaker to provide the best mix in terms of relevance and usage in everyday conversations etc. Every lesson is to be done twice over the course of 3 months; after that you should repeat the whole set of 90 lessons again to revisit the phrases and make sure you imprint those natural speech patterns into your mind. What’s very important – it’s not only about memorizing the phrases; your mouth gets trained to produce English sentences INSTANTLY and you can easily REPLACE some words to create new sentences depending on the specific situation. All of a sudden speaking English becomes your second nature instead of racking your brain and trying to stick words together as you speak! Also, there’s a set of 10 meditation lessons included in the English Harmony System and they’re based on using affirmations and visualization to build one’s confidence. This is very, very important because most of my fellow foreigners who struggle with English fluency also experience confidence issues and are afraid of making mistakes while speaking, which in turn leads to all sorts of problems – getting tongue-tied, hesitation, and others. So as you can see, the English Harmony System is going to address ALL the different aspects of your spoken English – it’s going to re-build your active vocabulary according to natural speech patterns, it’s going to enable you to speak instantly and without thinking, and it’s going to make you into a confident speaker who’s not afraid of making mistakes BUT also speaks with confidence and can speak about any topic with anyone! Q: Are the lessons in the English Harmony System de Luxe Edition the same as your YouTube channel videos? A: No, the speech exercising and meditation lessons are completely different. They’re recorded by native English speakers – professional voice artists with impeccable English pronunciation – and all content has been created by a native English speaker, too. The speech exercising lessons are interactive, i.e. – you’re required to take action by clicking on active areas in the Flash videos to do the repetition and dialogues. My YouTube videos, on the other hand, are purely of an informative and motivational nature. 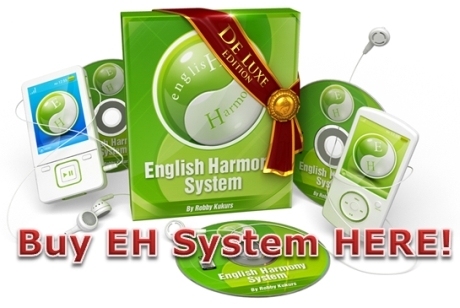 Q: What level of English is required to use the English Harmony System de Luxe Edition? Can even beginners with little English knowledge use it successfully? A: This multimedia course is for those who have already spent a considerable amount of time studying English but still haven’t reached spoken English fluency. You need to understand everyday spoken language used in the lessons to make it work for you. Of course, you might come across a few words and expressions that might require you to look them up online; however, all content has been created so that it’s as self-explanatory as possible. So even if some words and expression might not be quite clear to you on their own, context will make it nearly impossible for you not to understand meanings of phraseology and expressions used in the English Harmony System de Luxe Edition. Q: What’s the total amount of time that I have to spend on using the English Harmony System de Luxe Edition? Am I really going to achieve complete English fluency after a month? A: If you follow the standard study plan, you’ll be using the English Harmony System de Luxe Edition over a six month period. And yes, even within the first month you’ll notice a considerable improvement to your English fluency and you’ll build upon it during the next five months. There are also two accelerated study plans I’ve created for those who want to shorten the study time and improve their English fluency rapidly; they’re 3 months and 2 months long and will require more of your time so would be best suited for someone with more time on their hands. Q: Is the English Harmony System de Luxe Edition downloadable? A: No – there’s no need to download anything! You gain an immediate access to the English Harmony System de Luxe Edition after the payment has gone through – all you need is an Internet access! Q: Can I possibly memorize every single phrase contained in the System and then retain them all in my memory? A: Here’s how the EH System is supposed to work. You learn the phrases and sentences. In the process you’re forming a habit of speaking spontaneously and without much planning, and that’s the main goal of the whole exercise! You won’t be able to recall every single one of those sentences AT YOUR WILL upon the completion of the course; it’s simply impossible. It’s not even remotely possible in your own native language – for example, start listing words starting with a particular letter and see how long the list is going to be. After a while you’ll realize that you’ve run out of words to list while at the same time it’s going to be obvious that there are thousands of more words starting with that letter! Same thing applies here – all that content you learn is going to be retained by your mind and while at certain times it will seem that you’ve forgotten most of what you’ve learnt, nothing could actually be further from the truth! When the right opportunity arises, you will be able to say the right thing; the trick is NOT TO FORCE yourself to recall this or that particular phrase or word when speaking; you have to kind of allow your mouth to say what it naturally wants and to your surprise you’ll see that on 90% of occasions you will say the right thing! Q: I’m interested in buying your fluency improving product, how can I do it? A: Please CLICK HERE to proceed to the signup page where you have to create a new account by choosing your username and password. After that, you’ll be taken to a payment page where you can choose to either pay with your PayPal account or your Credit Card if you don’t have a PayPal account. As soon as the payment is processed, you’ll be able to log into your account from your device and have an immediate access to all 4 English Harmony System’s Modules and the eBook Insider’s Secrets! Q: What is English Harmony all about? Is this a website for English learners? A: English Harmony is a website for those foreign English speakers who don’t have much difficulties understanding, reading and writing in English but they’re struggling with speaking in English. Being very nervous and too embarrassed to speak, making all sorts of mistakes and not being able to say anything in front of other English speakers despite clearly knowing in your head what you want to say – they’re the kind of issues I’m dealing here on English Harmony. In other words – if you can read my website and understand everything, but you’re aware of certain English fluency issues and limitations you may be having – clearly my website is for you! Q: How can I improve my English? A: I keep receiving this question all the time, and it’s so general that it’s kind of hard to give a short and thorough answer to it. I’ve written a blog post explaining the basic concept behind English improvement and what you should focus on, so please read that article here. It should give you the basic understanding of what English improvement entails, what you should stop doing, and what you should start doing on a regular basis to develop your English fluency. Q: How can I speak like a native English speaker? A: Well, first of all let me point out the obvious pitfall in this approach – if you’re setting yourself up against native speakers, there’s a big chance you’ll keep running into fluency problems all the time simply because native speakers have been speaking English since they were toddlers, and we shouldn’t aim to reach that level! While it’s doable, it would require half your lifetime! It’s better to stick to realistic goals, stop comparing yourself with others, developing your potential to its full and find comfort in the knowledge that your English is unique – it’s YOURS, and it doesn’t matter if you can’t be as fluent as a native English speaker. buy the English Harmony System de Luxe Edition – it might just make all the difference between your fluency now and a couple of months down the line! Q: Do you offer Skype lessons? I’d like to practice English with someone so could you help me out with this, Robby? A: Yes, I have an English fluency coaching program which is all based on live Skype chat sessions, and it’s called Fluency Star. It re-opens every couple months because I can take only so many students on board at any given time, but needless to say it’s effective and will do wonders to your ability to speak fluently! It follows the same principles as the English Harmony System – namely, repetition, memorization and speaking out loud without much thinking except for the fact that now it’s ME who’s talking to you! That way we can work on perfecting your speech to a much greater degree than if you were doing the English Harmony lessons only.